Queue is a linear data structure which follows a particular order in which operations are performed. The order is First In First Out(FIFO). The literal meaning of queue is a waiting line. A good example of queue is any queue of consumers for a resource where the consumer that came first is served first. Suppose you went to McDonalds and want to have a burger, so whoever came first is served first. It is very close to the real life queue. The difference between stacks and queues is in removing. In a stack we remove the item the mostly added; in a queue, we remove the item the least recently added. Enqueue- Adds an element to the queue and if the queue is full, then it is said to be an Overflow condition. Dequeue- Removes an element from the queue. The items are removed in the same order in which they are pushed. If the queue is empty, then it is said to be an Underflow condition. Front- Get the front item from the queue. Rear- Get the last element from the queue. So, the first element O1 enters from the rear end. Subsequently, all the elements enter from the rear end. Now, if we want the an element to be removed then it is done from the head of the queue. So, if we call remove, then O1 will be removed first. In queue, we operate on the first element that is added but in stack we operate on the last element that is added. Queues allow duplicate elements to be entered in the collection. Queues donot allow null elements to be entered. Queue supports all methods of Collection interface. All Dequeues are not thread-safe. Queue is used when things have to be processed in First In First Out Order(FIFO) which is useful in following scenarios. When a resource is shared among multiple consumers like Disk Scheduling, CPU scheduling, etc. When data is transferred asynchronously between two processes like IO Buffers, pipes, file IO, etc. Now, why do we have two methods to do one task? Meaning, why do have add() and offer() to perform an insert operation on a queue? This is because if any error occurs, then the first method, i.e, add() will throw an exception. Whereas, the second method will return a special value instead of throwing an exception that will tell you whether the operation that you wanted to perform was successful or not. // Method to add an item to the queue. // Method to remove an item from queue. Time Complexity: There is no loop in any of the operations. So, the time complexity of all operations like enqueue(), dequeue(), isFull(), isEmpty(), front(), rear() is O(1). In queue, front and rear are the two pointers that we maintain. The front points the first item of queue and rear points to last item. enQueue(): It adds a new node after rear and moves rear to the next node. deQueue(): It removes the front node and moves front to the next node. // Method to add an key to the queue. // Method to remove an key from queue. // If queue is empty, return NULL. Time Complexity: There is no loop in any of the operations. The time complexity of both operations enqueue() and dequeue() is O(1) as we only changed few pointers in both the operations. Circular queue also known as Ring Buffer, is a linear data structure in which operations are performed based on First In First Out(FIFO) principle. 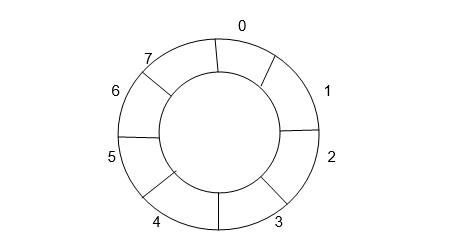 The last position is connected back to the first position to form a circle. In normal queue, we can not insert the next element once queue becomes full even if there is a space in front of the queue. Front: Get the front element from queue. Rear: Get the last element from queue. enQueue(value): Inserts an element into the circular queue. In a circular queue, the new element is always inserted at rear position. Check whether queue is Full – Check ((rear == SIZE-1 && front == 0) || (rear == front-1)). If queue is not full then, check if (rear == SIZE – 1 && front != 0) if it is true then set rear = 0 and insert element. deQueue(): Deletes an element from the circular queue. The element is always deleted from the from position. Check whether queue is Empty means check (front==-1). If queue is not empty, check if(front==rear), if it is true then set front=rear=-1, else check if(front==size-1), if it is true then set front=0 and return the element. private int rear;//rear position of Circular queue(new element enqueued at rear). private int front; //front position of Circular queue(element will be dequeued from front). * Enqueue elements to rear. throw new QueueFullException("Circular Queue is full. * Dequeue element from Front. * Check if queue is full. * Check if Queue is empty. Time Complexity: There is no loop in any of the operation. So, the Time complexity of enQueue(), deQueue() operation is O(1).